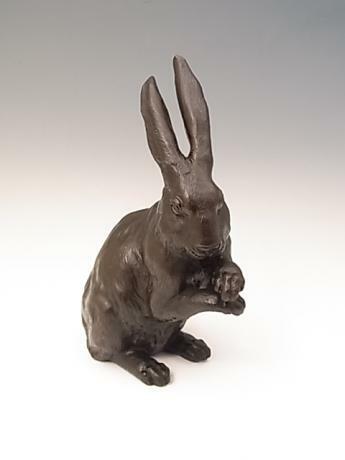 Japanese early 20th century Period bronze USUBATA. This USUBATA is wonderfuly designed with rabbits and a utensil to pound rice cakes with. 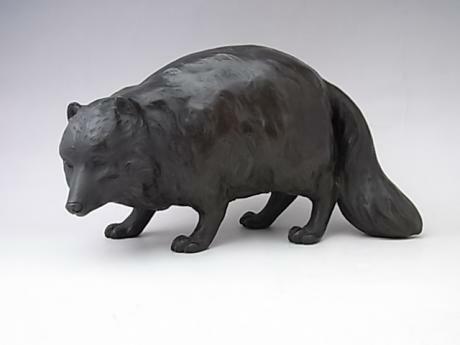 The rabbits, one on each side form unqiue handles for the USUBATA flower container. Unsigned. 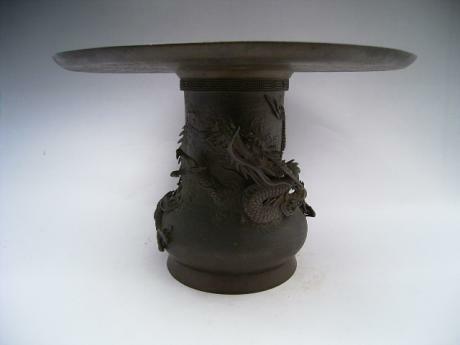 It measures 11 1/2" tall, 11 1/2" in diameter at the top and ..
Japanese Meiji Period bronze vase. The vase has a poet on the front and bamboo and plum blossoms on the reverse. 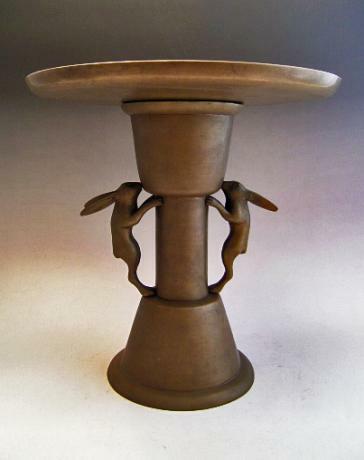 The handles are done in the shape of stylized elephant heads. Beautifully done with gold, silver and SHAKUDO inlays. Unsigned. 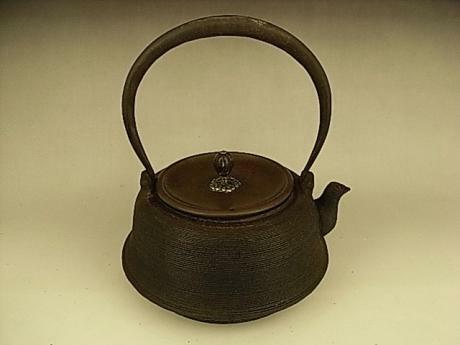 The vase measures 13" tall and 8" wide at the handles..
Japanese early 20th century iron kettle. This pot is done in a simple design with horizontal lines etched around the entire top portion of the kettle. The handle on the kettle is done with silver inlays in the shape of leaves and branches. 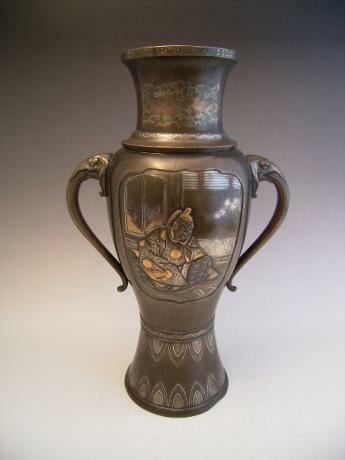 There is also a decorative silver form under the lid handl..
Japanese 20th century large silver vase with crane design. 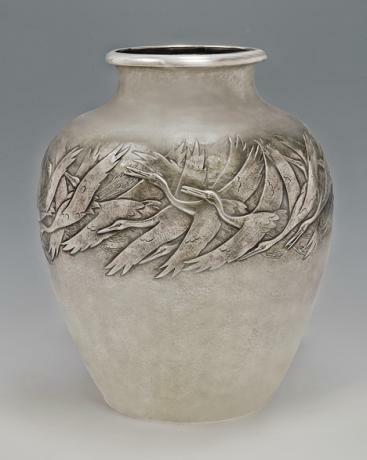 The design is of numerous cranes flying around the upper mid-section of the vase. The centers of each eye is done in gold gilding as are some of the legs. Signed GYOUYOU. 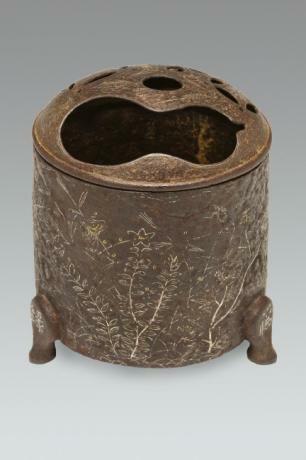 Also marked JUNGIN MITSUKOSHI, which means pure silver and made ..
Japanese early 20th century KOMAI style hinged box. 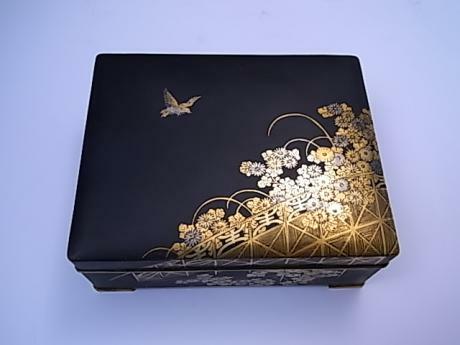 The box has the design of a single bird flying over a fenced garden of blooming chrysanthemums. 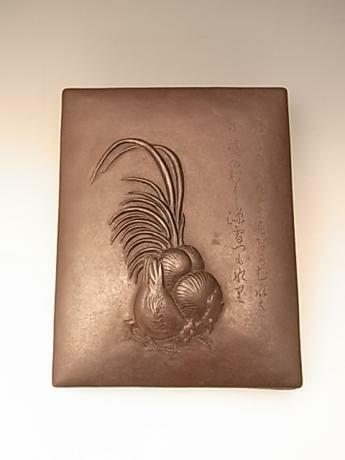 This box was used as a commemorative gift for someone's 50th anniversary at a company, presented in Taisho 15 or 1926. The box measures 4 3/4" wide,..